2012 is a unique year – for the first time since 1992, both the US and South Korea are holding presidential elections in the same year. By virtue of having been in California on business during US election day last month, I am also in the unique position to get to watch both elections first-hand once I witness Korean election day on December 19th. Bear in mind that what I am about to write only reflects my somewhat limited view of the Korean election based mostly on what I read in English-language media. I don't have a vote and I certainly don't have a dog in the fight. So everyone in the world now knows that Barack Obama has been confirmed for a second term as President of the USA. Far fewer have probably been following the goings-on of this peninsula of 50 million people. Let me fill you in. South Korea elects a new president every 5 years and said president cannot serve a second term. Hence, we know for certain that current president Lee Myung-Bak is a lame duck. Presidential advertising banners showing the candidates can be found all over Seoul now, and though Korea has a multi-party system the country only has two candidates with any legitimate shot of winning: Park Geun-Hye of the governing Saenuri Party and Moon Jae-In of the opposition Democratic United Party (DUP). The stories behind these candidates I find fascinating and the candidates appear to represent distinctly different choices, much like we had in the Obama/Romney election in the US. Ms. Park represents the conservative, pro-business, pro-American ruling Saenuri Party. 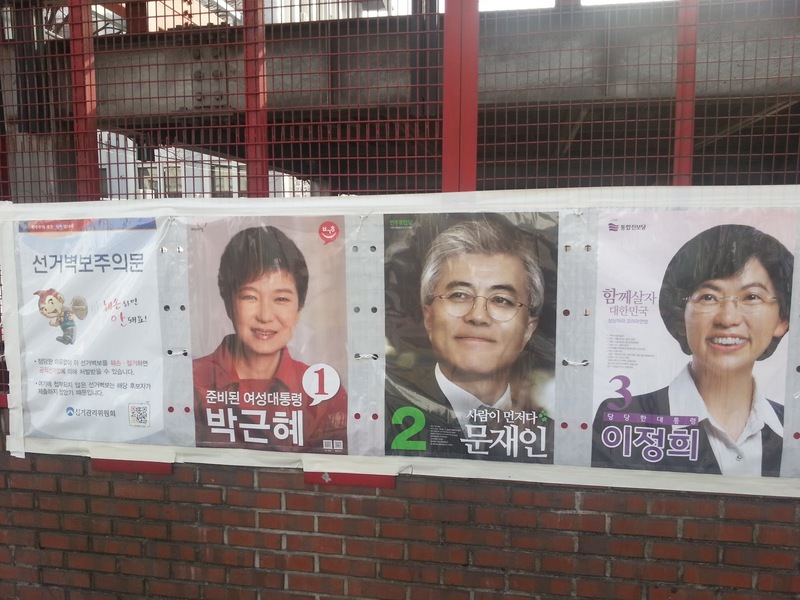 Much like the Republican party in the US, the Saenuri seem to poll well with older and rural voters. Ms. Park is the daughter of the former dictator Park Chung-Hee, a man that ruled South Korea with an iron fist for two decades as he oversaw Korea's economic miracle, transforming the country from one of the poorest nations on Earth to an Asian "tiger". Under dictator Park's rule, the chaebol business conglomerate system took hold and behemoths such as Samsung, Hyundai, and LG emerged as manufacturing dynamos in the new economy. The methods by which dictator Park enforced the rule of law were harsh and Ms. Park has been forced to apologize for the abuses of his police state during her campaign. Mr. Moon represents the liberal DUP, certainly less business-friendly than the Saneuri and more likely to try to engage with North Korea diplomatically. This party seems more like the Democratic party in the US – labor-friendly with more urban support. Moon has campaigned to break up the chaebol and limit the power of the family oligarchs that control them. Chaebol seem to hold a place in Korean politics similar to "too big to fail" banks in the US – attacked easily and relentlessly by populist rhetoric but very difficult to change in practice. A human-rights lawyer, Moon was thrown in jail by Park's father following a university protest. Moon served as the chief of staff for former liberal president Roh Moo Hyun, who committed suicide after leaving office in a corruption scandal. So both candidates have skeletons in their closets. The campaign has dominated Korean news since I arrived in August, but interestingly I haven't seen any campaign ads on Korean TV. I watched the first televised debate last week, which made very little sense as I understood almost none of what was said. It did seem civil, though the words may have indicated differently. My ears perked up when I heard one candidate say "Samsung...chaebol...<unintelligible Korean>", which I'm assuming was a discussion about business policy. At another point I heard, "...Meguk...Ilbon...Chunguk..." which I'm assuming was a foreign policy discussion since the Korean names of the USA, Japan, and China were mentioned. 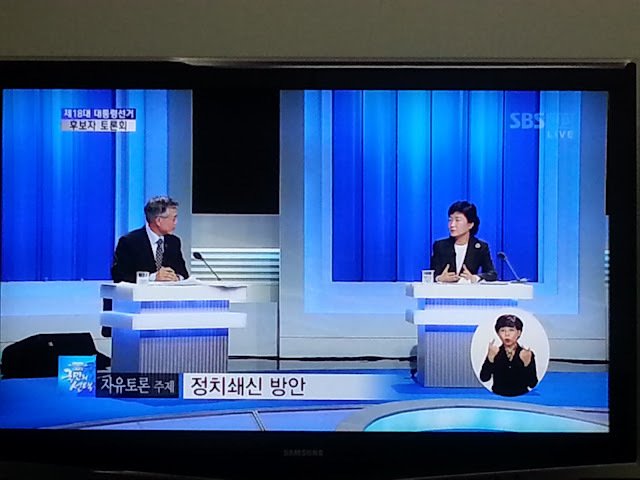 Interestingly, the Koreans invited a third party candidate, whose name I don't even know, and said candidate received equal air time. The debate mostly consisted of the candidates getting to ask questions to each other. So Ms. Park was able to ask a question to Mr. Moon, and then vice versa. I think this format could really spice up American presidential debates! Like Obama in the US election, Ms. Park has held a small but steady lead over Mr. Moon in the polls throughout the campaign, so odds are that she will win this election. There is an X-Factor, however, in the form of Ahn Cheol-Soo, a self-made business tycoon who flirted with a campaign for a couple months before dropping out. Like Ross Perot in 1992, Ahn wanted to shake up the political establishment by running as an outsider, but just as Perot split votes amongst the anti-Clinton camp in 1992 Ahn was about to split the anti-Park crowd, handing Park an easy victory. Some behind-the-scenes drama to unite the Ahn and Moon campaigns failed as the political insider Moon refused to step aside, and Ahn reluctantly ended his campaign only a couple weeks ago. The charismatic Ahn could play kingmaker here but he has only given lukewarm support to Moon thus far, and a large number of Ahn's supporters (many of them disillusioned but flaky younger voters) may not vote at all. If Park does manage to hold on to her lead and win the presidency, it could represent a watershed moment for women's rights in South Korea. In the latest World Economic Forum Gender Gap report, South Korea ranks 108th out of 135 countries surveyed, only slightly above most Middle East countries and worst in the OECD. 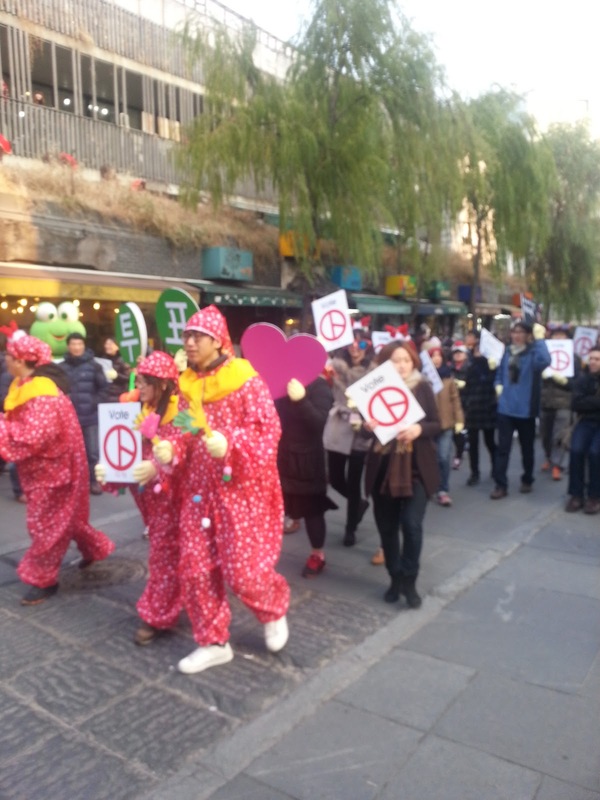 A Park victory would deeply challenge the long-entrenched patriarchy dominating Korean society, a legacy that may well prove more fruitful than any policies which she enacts.